Atrium Condos in Breckenridge CO Real Estate are in-town Breckenridge condos found two blocks from Main Street on French Street. Built in 1981 there are 36 condos comprised of 6 – one bedrooms, 20 – two bedrooms and 10 – three bedrooms. Atrium condos are spacious with the one bedrooms having 825 square feet, two bedrooms are 1,050 and three bedrooms are 1,562 square feet. Each of these Breckenridge condos has use of the underground, spacious indoor lounge area, on-site exterior hot tub and outdoor deck area with built in grills. Atrium condos also have a bus stop out the front door of the building. Less than one block away is Carter Park where there is a dog park, sledding hill, picnic tables and playground. 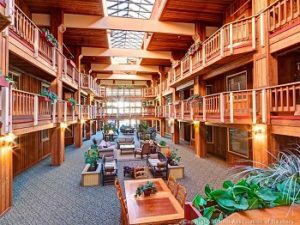 Atrium condos in Breckenridge Real Estate are perfectly located for enjoying all that Breckenridge has to offer in the winter and summer.